OJ&B Makes The Scene Bisnow & Happy Thanksgiving! I was all kinds of excited today when I got my daily The Scene Bisnow e-mail and saw that OJ&B had a mention and picture for attending friend of Orange Juice and Biscuits, Rolando Santana's, Holiday Party in their "Happy Thanksgiving" edition! It was a great party with super tasty food! It is always fun at Rolando's midtown show room and I love the piece of gossip that they attached to the picture about OJ&B's 1st Birthday Party that was held there. I also love that they snapped me with my friend, Alex Liang, editor-in-chief of KENTON Magazine! 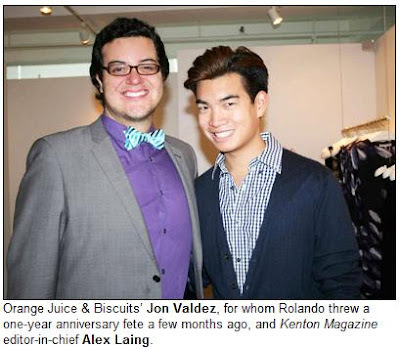 Above: The caption reads, "Orange Juice & Biscuits’ Jon Valdez, for whom Rolando threw a one-year anniversary fete a few months ago, and Kenton Magazine editor-in-chief Alex Liang." A fete! Love it! The Scene Bisnow publishes 16 fun, informative, and mercifully short online newsletters in nine cities and covers the hottest event and parities with the best people in NYC, so it is a honor to be mentioned! 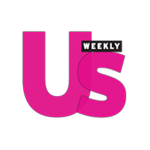 Check out the entire "Happy Thanksgiving" edition to see other events and people mentioned including designer Kenneth Cole and performer Fabolous by clicking here. HAPPY THANKSGIVING TO EACH AND EVERY ONE OF MY READERS AND SUPPORTERS! I am very thankful to have some of the best readers for all over the world! I have had a very blessed 2010 and I am looking forward to an even bgger and better 2011! Thanks so much and I hope you all have fun eating and being fierce with family and friends!